In October, astronomers discovered that our solar system has been visited by an interstellar traveler. It's not a spaceship — because that would be truly huge news — but a natural object: a 500-foot chunk of material designated as A/2017 U1. It is still big news since A/2017 U1 is the first large object passing through our solar system that we know originated in interstellar space. At the time it was discovered on October 19, by Robert Weryk using the Pan-STARRS telescope in Hawaii, A/2017 U1 had already swung through its closest approach to our sun — "perihelion" — and was moving away. But astronomers tracking its movement were able to plot its trajectory, which led to the revelation that A/2017 U1's orbit is hyperbolic — definitive proof of its interstellar origin. Unlike the orbits of planets, comets, and asteroids that perpetually run laps around our sun on closed, elliptical loops, a hyperbolic path is "open," like a boomerang with infinitely long ends. The middle of the boomerang's bend is where the object makes its closest approach to the sun. 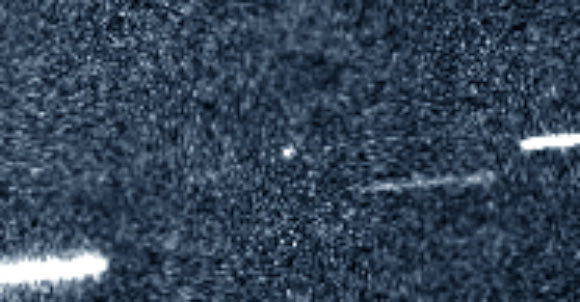 A/2017 U1 was originally classified as a comet since its hyperbolic path resembles the orbits of "long-period" comets that travel very far into space, but are otherwise gravitationally bound to the sun and orbit it in a regular cycle. Comets are common fare in regions far from the sun, where sunlight is weak and volatile ices can remain frozen and stable. Almost all of the comets that swing close to the sun spend most of their time in the Kuiper Belt beyond Neptune's orbit, or in the much more distant Oort Cloud, which surrounds the solar system like a vast, frosty bubble. It is only when a comet heats up near the sun that some of its ices are vaporized and out-gas to form its long, iconic tail. 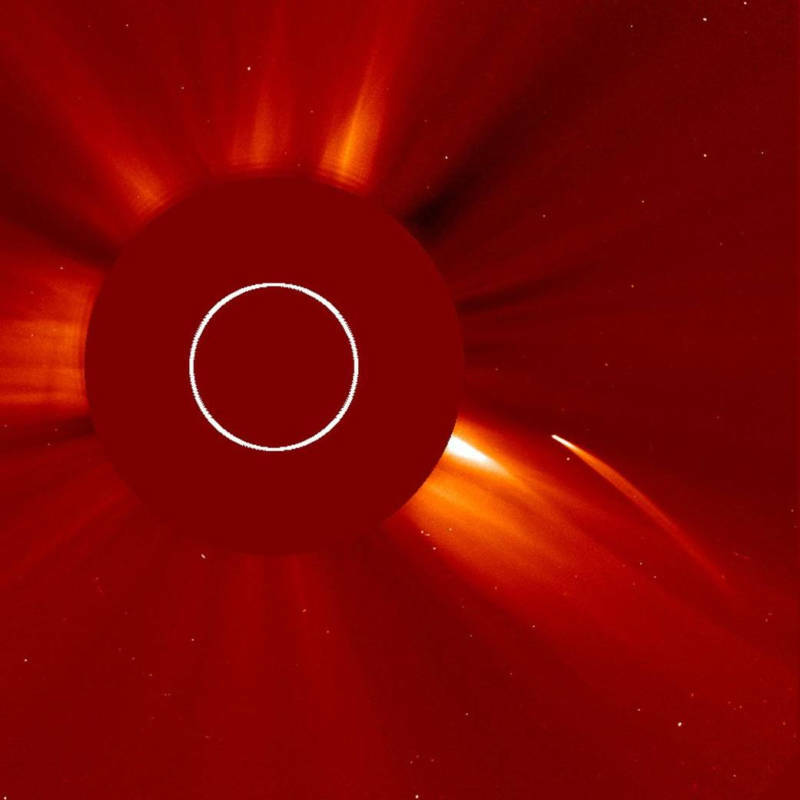 However, when astronomers pored over data acquired by the SOHO spacecraft around the time of A/2017 U1's perihelion, no comet-like behavior was detected in the sun's vicinity. At its closest approach the object was only 23 million miles from the sun, closer than the planet Mercury and within SOHO's field of view. If it were a comet, SOHO should have detected out-gassing caused by the sun's intense heat. The lack of out-gassing shows that A/2017 U1 contains little if any frozen volatile materials, and must be composed of rock or metal — like an asteroid. We are accustomed to thinking of asteroids as objects that spend most of their time relatively close to the sun, where the steady and strong sunlight vaporizes any ices. 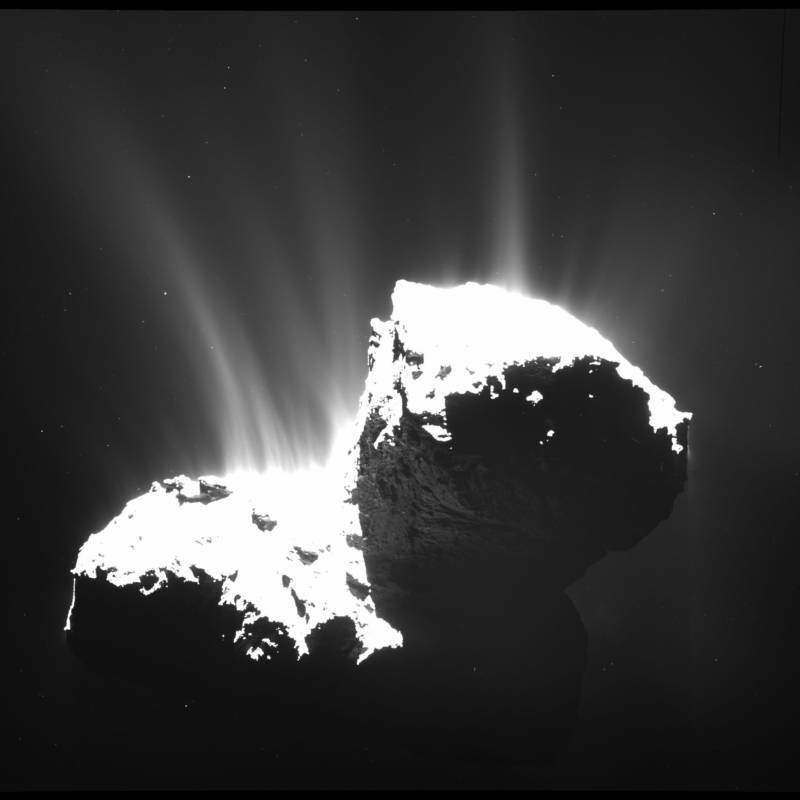 Objects that originate farther out tend to be comets, containing substantial amounts of ice. So, discovering an interstellar object that has spent probably hundreds of thousands of years in cold interstellar space, and yet is not a comet but an asteroid, is an even more exciting event. Where Did A/2017 U1 Come From? The "legs" of A/2017 U1's hyperbolic orbit — the long, stretched arcs of the boomerang's ends — point in the directions it came from and where it is now heading toward, respectively. The object appears to have cruised in from the direction of the constellation Lyra, somewhere near the star Vega. This doesn't mean that it originated at Vega, or from any of the stars in that region of the sky. At its interstellar cruising speed of 16 miles per second, it would take almost 300,000 years to travel the 25 light years from Vega to our solar system. In that time, the stars have moved along their own paths, rearranging themselves in space and making it nearly impossible to determine A/2017 U1's true point of origin. It's likely that this asteroid did originate in a star system long ago and was ejected into interstellar space. It has been theorized that even in our solar system, comets and asteroids have been flung into interstellar space by the gravitational influence of giant planets, like Jupiter. Such evictions would have been especially frequent when the solar system was young and there were many more chunks of rock and ice flying about. So, it can go both ways: we were just buzzed by an interstellar asteroid that probably came from another star system, and somewhere else in the galaxy a comet or asteroid that originated in our own solar system, flung out millions or billions of years ago, may be whizzing past another star. Though A/2017 U1 is a natural object, and not an alien spacecraft like the one featured in Arthur C. Clarke's novel, "Rendezvous With Rama," there is, in fact, at least one known spacecraft in interstellar space: our own Voyager 1, which we launched back in 1977. Voyager 1 officially entered interstellar space in 2013 when it passed through the heliopause, the tenuous boundary between the bubble of gases blown out by our sun and what lies beyond. In fact, Voyager 1 achieved solar escape velocity in the same way that in theory A/2017 U1 escaped from its parent system: through interaction with a massive planet — in Voyager 1's case, Jupiter. 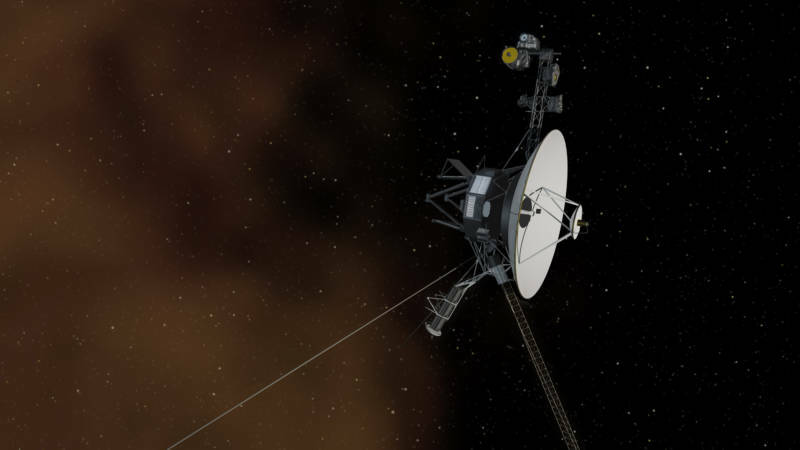 Before its encounter with Jupiter, Voyager 1 lacked the speed to break free of the sun's gravitational pull, but after accelerating under Jupiter's gravity it was flung into a hyperbolic orbit and became, as NASA put it, ". . . destined — perhaps eternally — to wander the Milky Way." But, just as with A/2017 U1, interstellar distances are vast, and the journey between stars is slow. Voyager 1 is expected to reach our solar system's cometary haven, the Oort Cloud, in 300 years, and then spend 30,000 years passing through it. In 40,000 years, Voyager 1 will pass within 1.6 light years of the star Gliese 445, enacting its own extrasolar rendezvous. In the meantime A/2017 U1 is heading out again. As of November 10 it is over 160 million miles from the sun and hurtling away at 25 miles per second. So, whatever it is — asteroid, or alien artifact — it won't be pass by ever again.